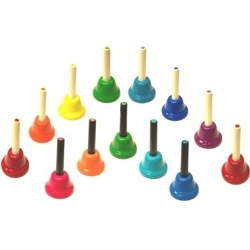 Top quality construction and accurate intonation make this 13 Note Chromatic Handbell Set the best value available. Bell section is made of metal for nice clear tone. C-c range, each of the 13 metal bells are marked with the proper note and number to help children learn the musical scale. Five inches tall, the long handles enable players to grasp the bells securely.